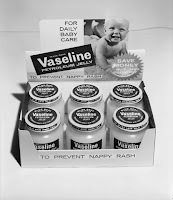 Apocalyptic Post - Ponderings of the Apocalypse: Post Apocalyptic Vaseline? The supplies included gallons and gallons of Vaseline, with advice for post-apocalyptic survivors to smear it all over their bodies as protection from radiation. ....as most intrigued by the four, five-gallon containers of Vaseline in each barrel. In the event of a nuclear attack, the instructions called for those taking radiation readings above ground to cover their bodies with Vaseline to prevent radiation poisoning. Hey it worked well for the dude in Blakely's Ark by Ian MacMillan. Vaseline is the wonder drug that works wonders. As I wasn't able to find any link to message or comment on the full blog I'll drop a comment on this one. I see it's a while since it was .. updated, but here goes. I love this blog. It's fantastic. Just what I've been looking for and it has info on everything I've thought about, like the emergency rations and the frozen seeds. Wow. This is. A great blog. Probably the best blog I've seen so far. I wanted to ask permission to link to it on my own blog, and drop a quick description as I'd like more people to know all this. -Thanks in advance, keep up the good work. Thank you Надя, its very nice to hear a comment such as yours, comments like yours make this blog worthwhile for me. Unfortunately I haven't had much time blog lately, even though there are heaps of post apocalyptic movies coming out (the Road, Book of Eli, etc). Hopefully I can find some new stuff soon. Of course its ok link, thanks so much for your support!